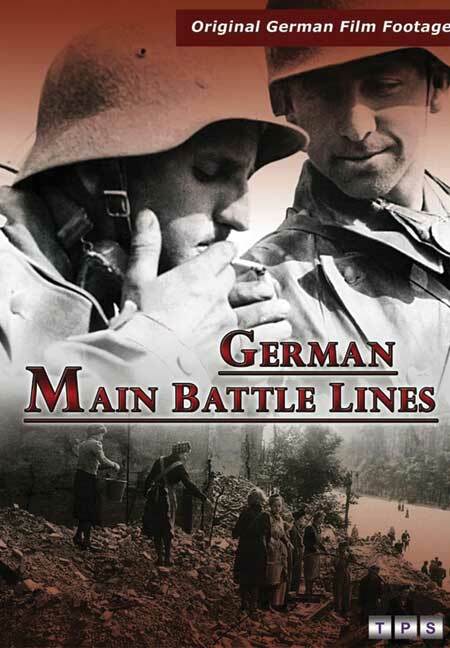 You'll be £14.99 closer to your next £10.00 credit when you purchase German Main Battle Lines DVD. What's this? During the year 1942, according to information from England, about 1000 attacks were flown on German territory, including 17 heavy attacks with a quantity of more than 500 tons of bombs and incendiary’s. In 1944 this figure increased almost fivefold to about 1.6 million tons. The German arms industry was not crucial affected by these attacks, on the contrary, in December 1944, the monthly output reached its absolute peak. In 1944, the Wehrmacht was on the retreat on all fronts. Gradually, the main battle lines moved ever closer to the Reich. Using original wartime film from German sources this DVD gives an insight into the ordinary fighting units and their weapons. The German war machine continued to function and factories produced tanks and artillery despite Allied bombing on a massive scale and this film explains how this was possible. Life on the German home front is rarely touched on in documentaries but this film does that along with home defence which are included in the bonus features. The fact that Germany was able to continue fighting a ‘total war’ for so long in the face of such adversity still amazed historians today and now doubt will do so for a long time to come. Our final DVD offering from Pen and Sword this month is a documentary featuring archive black and white footage that traces some of the highlights of the war from the German military perspective, looking at the Allied bombing of the German mainland and the various attacks. As with the other titles various bonus galleries are included on the DVD. The real value is in the footage with sparse commentary, much of which is original and a Nazi propaganda presentation. In this DVD there is interesting colour footage of pre-1939 Germany and a selection of footage showing how women took over an increasing number of jobs to free men to fight in battle. The film and the stills gallery provides a view of civilian life in Germany under continuous aerial bombardment. In addition to showing the civilian population working to support the military the air defence system if covered. The main target market for this DVD series is undoubtedly the military enthusiast, but the DVDs are affordable for a much wider range of viewers and should sell well.